This is a reprint of the Bawnboy Workhouse article by the late Rev Patrick F. Brady originally published in 1979 in the booklet ‘Templeport, Souvenir of the Dedication of St Mogue’s Church’ with permission from his sister Theresa McKiernan . Thousands of Irish people were destitute in the first quarter of the 19th century. This was due to the economic and agricultural depression of the 1820s and 1830s and the number of starving poor was increasing. To meet this situation there was Government machinery. Ireland had no poor law as in Britain. The hospitals. alms houses orphanages that did exist were supported from private funds. The Government felt that the welfare of the destitute was not the states function. As one Liberal stated 'if a man wants to starve he should be free to do so'. The measures of relief forced on the state the by humanitarian interests ware given reluctantly and always with a sharp eye on economy. In 1832 Lord Grey the Whig Prime Minister set up a committee to examine the situation and advise him. There were two ways of helping the poor: First by outdoor relief giving them sufficient to live on in their homes and secondly indoor relief bringing them into an establishment and supporting them. The members of the 1832 committee suggested an elaborate scheme based on outdoor relief. . A voluntary committee was set up in each parish which would levy a rate on the parish. More funds would come from a stiff tax on absentee landlords. The committee would use it funds to support public works, road making, drainage and land development. Moreover it would assist people to emigrate. It would help people to live in their homes and a also develop the country. The Whigs felt this would be too expensive and an Englishman George Nicholl was sent to see if something could be done with less expense to the ratepayers and absentee landlords. The result was the Poor Law of Ireland Act of 1838. Imitating the Poor Law of England enacted earlier it was based on indoor relief. According to the plan Ireland was to be divided into 120 Unions (i.e. unions of parishes). A central site would be chosen in each union where a workhouse would be built. Each Union was to be governed by a board of guardians, some nominated by the Grand Jury and the rest by the ratepayers. The Guardians would levy a rate on the Union and use the proceeds to support the workhouse. Discipline in the home was to be strict and the diet was to be limited. In this way it was hoped that nobody would seek admission to the workhouse except a really destitute person. The Poor Act was met with opposition all over Ireland. Daniel O'Connell opposed it vehemently. But in spite of opposition it was put into operation fairly smoothly. Unions had already been established in Cavan, Mohill, Bailieboro and Cootehill and in 1850 Bawnbov was set up covering Templeport. Kildallan, Newtowngore, the two Drumreillys, Ballinamore,. Swanlinbar and part of Glangevlin. The Anglo-Celt records a meeting on 17 Feb. 1851, Moses Netterfield in the chair. Also present wore James Benison. J.P, John Johnstone, J.P. John Brady. John King, Nathaniel Maguire. Thomas Veitch, Dennis Kiernan, Michael Creamer, David Finlay. Colonel Clark of the Poor Law commissioners was in attendance and announced that he had been sent to select and lay out a site for the workhouse. . Captain Johnstone, agent for D, Rochford, the landlord of the area offered a site of 8 Irish acres. The price would be £200 with a ground rent of £1:6:3 per acre per year for 20 years. i.e. £210 over a 20 year period. Captain Johnstone later appealed to the Poor Law Commissioners in Dublin and was awarded £1:10:0 per acre per year. .
A letter from the Poor Law Commissioners in Dublin dated 14th June 1851 informs the Bawnboy Board of Guardians that the tender of Mr James Creden, Enniskillen, had been accepted for the building of the workhouse, his tender of £4,800 being the lowest of the proposals received. He was to lodge £500 with the board as security and complete the building within 18 months of the signing of the contract. Another letter at this time states that Mr Robert Spence has been appointed as clerk of works to superintend the erection of the building at a salary of 2gns per week from the date of his arrival on the site. The rate for the Union at this time was 10d in the pound. At this period destitute people from the area were housed in Mohill, Cavan, and Enniskillen and it is from the minutes of the Cavan Board of Guardians that we get the next item of information. At a meeting of the Cavan Board it is stated that Mr Benison of Bawnboy would come on 30th November 1853 and bring 52 inmates to the new workhouse. Thom's Directory of 1854 gives the date of the opening of Bawnboy workhouse as 24th November 1853 with Mr John Carson as Master. Jane Brownlow as Matron. Winslow Finlay, Medical Officer and Ralph Montgomery, Clerk. It wag capable of housing, 550 people. At no time in its history did it house even half that number so that as happens with ether bodies the Poor Law Commissioners were more conscious of a plan than of the needs of the area. 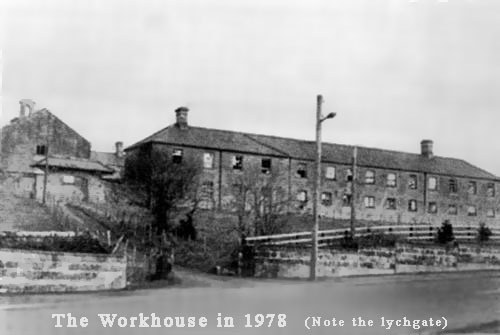 It is almost impossible to get information about the workhouse during the 1850s and 1860s. The minute books for that period of the Bawnboy Union have disappeared. The 1869 book is intact, then there is a further break until 1879. Coverage by the Anglo-Celt is also poor until the turn century and then it becomes a valuable source, covering all meetings. From the practice of other Unions we know that inmates in Bawnboy were subjected to severe discipline. They were not allowed to leave the building nor permitted to talk to passers-by. Punishment consisted of a period in the lock-up - a form of imprisonment. If they absconded and were caught they spent a long period behind closed doors. If an inmate again broke bounds he was expelled but not before handing over all clothes given to him by the Union. The fact that he might die of exposure was not taken into account. Children were privileged, being allowed or rather ordered to go outside the walls for a walk three times per week accompanied by a teacher. Within the building, however, there was strict segregation of boys from girls even of the same family. They had separate schoolrooms and living quarters. In many of the Unions there were complaints about low standards in teaching and of the poor quality of teachers recruited but Bawnboy seems to have been lucky in its teachers and any inspector's reports that have come to notice are favourable. The food in Bawnboy workhouse was not luxurious but adequate. Breakfast was a mixture of oatmeal and Indian meal boiled together and served with buttermilk. Dinner consisted of potatoes with sweetmilk and sometimes meat, but in the orders for provisions there was always a distinction between paupers' meat and officers' meat. Evening meal was of porridge with bread and milk. In late spring and summer when potatoes were scarce bread was served at dinner. At Christmas and mid-summer there were helpings of sweet cake at evening meal. Bawnboy workhouse was built primarily to house destitute people but the infirmary was to be at the disposal of any inhabitants of the Union who needed hospitalisation. A rate payer was expected to pay a fee and was also liable for his employees. The planners did not envisage infectious diseases and in 1855 were forced to build a fever unit. The Anglo-Celt, 8th January 1855, has an advertisement inviting tenders for a fever hospital. Names of two sureties of £400 were to be submitted with each tender. We have no record of when this building was completed nor do we know what the contract price was. In 1869 there is a mention of patients in the fever wards as distinct from those in the infirmary. An ad. for a nurse at this time states that she will be paid £8 per year with apartments and rations. In 1855 the average number of inmates in the home on a given week was 172. The weekly cost of an inmate was 2-3d and of a patient in the infirmary 3-1 ½ (three shillings and a penny halfpenny). A report of April 1879 gives a list of officers of Bawnboy Union for that year: Chairman, David Finlay, Brackley, Vice-chairman, Nathaniel Maguire, Ballinamore, Deputy Vice-chairman, Peter Maguire, Clerk, James McGovern, Swanlinbar, Medical Officer, George Hearne, Some salaries for the half year were as follows:- Rev, Rawlins, Protestant Chaplain, £6-15-0; Rev Terence McGovern, R.C. Chaplain, £8-15-0; Clerk, £16-15-0; John Carson, Master, £10-0-0; Mary Keane, Matron, £6-10-0. The Master, Mr Carson, reports that milk supplied by Mr Dolan had 10 degrees of cream, that supplied by Mr McCaffrey had 10 ½ degrees, while buttermilk supplied by Mrs Maguire was of good quality. Supplies for the week:- Bread: 810 lbs. Butter: 29 lbs. Beef for officers: 29 lbs. Beef for paupers: 36 lbs. Buttermilk: 210 quarts. Sweetmilk: 310 quarts. Sugar: 1 cwt. Starch: 12 lbs. It was also noted that Miss Kate Gormley, assistant school mistress, was invited to training and it was proposed that she get leave and appoint a successor. An amendment that the Board appoint a successor was carried. Next meeting it was announced that with the approval of the school inspector her sister, Margaret was left in charge by Miss Gormley. was announced that with the approval of the school inspector her sister, Margaret was left in charge by Miss Gormley. The Board voiced its disapproval and declared Margaret's appointment void. It is noticeable that whenever an appointment was being made all the Board members were in attendance but for normal business it was often difficult to get a quorum. Michael McCabe, Ballyconnell, tendered 7d per pane for large and small panes. Mr McTeigue, Bawnboy, tendered 1 shilling for large panes and 5d for small. As there were so many small panes and comparatively few large panes the contract was given to Mr McTeigue. Subsequently Mr McCabe wrote to the Poor Law Commissioners in Dublin saying that he had been unfairly treated. McTeigue have got preference because he came from Bawnboy. A copy of the minutes covering the appointment was sent to Dublin. In 1902 the chairman of the board was L. Dolan, Garryfliugh, Ballinamore, vice-chairman, E. McGovern, Bawnboy, medical officer Francis J. Teevan. At a meeting in January of that year a letter from Local Government was read pointing out the necessity of having a second ambulance for patience with infectious diseases. Mr Edward Reilly ( a member) "How did them manage when there was no ambulance. We spent £24 on the last ambulance . They want to cripple us with rates." Chairman: "Naturally we need one for fever patients and another for ordinary cases. Would any member here like to travel in an ambulance that had recently carried a fever case." The Chairman's appeal was ignored and it was decided that one ambulance was adequate. The ambulance driver was given instructions to disinfect the ambulance subsequent to carrying a case wit infectious disease. A bill for £27-13-11 for electric bells was received with consternation. One member felt the Shelbourne Hotel will not be able to compete with us. A letter from Nurse Bridie Kane giving one month's notice of resignation received the comment, "nurses are treating this place as a lay-by." Later in the year Clerk James McGovern reported ill and his assistant Michael Bannon was appointed as a substitute at £1 per week. The Cavan Weekly News reports a full meeting of the Guardians on 31st March 1906. The assembled to elect a new clerk in succession to James McGovern who had resigned. Mr Michael Bannon (acting clerk) said there was only one applicant, himself. He had two sureties. Mr Baxter of Killycrin and Patrick Plunkett of Meenaghan. Amid numerous speeches Mr Bannon was declared elected. One member in the course of his remarks reminded Mr Bannon that he had personally favoured his appointment because of the obedient way he had assisted Mr McGovern, a hard task-master, but warned him not to get too big for his boots in the years ahead. His salary would be £50 per year. Later in the meeting a member objected to sending patients from the workhouse to Dublin hospitals. "Was Bawnboy not good enough?" he asked. Dr Teevan patiently explained that some patients needed specialist treatments and were entitled to the best that could be given. Moreover there were no facilities in Bawnboy for major operations. In June of that year Dr Teevan reported that six patients suffering from typhoid were progressing favourably and one would soon be discharged. Mr Shannon of Meenaghan demanded that as soon as the patients got well the extra nurses be discharged. "We have too many nurses" he said. "and they don't look after the patients at night. They are trunning around the country spreading infection". This statement reported fully in the Cavan Weekly News created a good deal of controversy later on. At a meeting in July Dr Teevan objected to remarks made by Mr Shannon at the previous meeting criticising nurses in the infirmary. He pointed out that nurse Saunters was on duty daily from 7am to 7pm.. Mr Shannon said that he had referred to the night nurse. At the following meeting there was a letter from a Nurse Slattery. "I am the only trained nurse on night duty , and in justice to myself I am bound to inform you that the remarks made by Mr Shannon at the last meeting that the night nurse never went near the patients except on a few occasions are untrue as far as I am concerned". Mr Shannon replied that he still believed there were too many nurses getting £1-10-0 per week for running about spreading diseases. A long letter from a former patient was read. He had been a patient for 9 weeks and said he owed his life to the good care of Dr Teevan and the nursing staff who had never shirked their duties. This letter was obviously directed to Mr Shannon who had the last word: "it would be more commendable if the same gentleman paid his outstanding bill to the infirmary." I found the wards and dormitories as well as out-offices much more tidy than at my last inspection. There is a sufficiency of water but the sanitary arrangements are of a primitive character. There are neither baths nor water closets and the arrangements leave much to be desired. The supply of bedding and clothing is generally good but the hair pillows must be a torture to the aged and infirm owing to their lumpiness. Steps should be taken to have these pillows opened and improved. I found the doors to the dining room unlocked. I found the drain or channel in the casual yard in a most unsanitary condition. Legends have grown up about the fever i.e. typhoid, which struck Bawnboy at various times between 1905 and 1918. The writer knew people who spent some time in the Fever Hospital and the impression was given that the wards were bursting at the seams with the sick and dying. The records show that on any week during this period there were never more than six patients in the fever wards. Admittedly the fever was an ongoing phenomenon. A patient might come home cured and his wife could then contract the diseases and replace him. A neighbour might be stricken later on. The usual cause of typhoid is contaminated water or inadequate sewerage. The spring well in Bawnboy was often tested and was always free from typhoid bacilli. Perhaps the source was the primitive sewerage facilities mentioned by the inspector. Moreover another report mentions a dangerous sewer in the village itself. Perhaps, too, some of the staff may have acted as carriers. Mr Shannon may have been closer to the truth than he realised though blaming the wrong people when he spoke of nurses spreading disease. In March 1915 a change of diet was recommended. This was to be the first change since 1852. Breakfast used to be Indian and oatmeal boiled and served with buttermilk. Now each inmate was to get 8ozs. of boiled oatmeal with 3 naggins of sweet milk. This was accepted by the board. For dinner in addition to potatoes and occasional beef there was to be a pig's head, pea soup and lentils. This was rejected. One guardian remarked. "a first class restaurant," and another, "the rate payers would come flocking in if we changed". On 23rd November 1916, Mary McBrien was locked up for 4 hours for abusive and threatening language to the matron. Later the matron reported that on release Mary threw water on her and stoned her window. Mary was to be summoned and charged at the next court. The master of the workhouse at this period was Peter McTeague. Nurses mentioned were his wife, Rose; nurses Byrnes, Carney, Doddy and Kate Dolan who was temporary. The inflation caused by the 1914 - 18 War began to effect running costs of the workhouse. In 1913 items bought from Wm Mullally read: eggs 10½d per doz., 4 lb. loaf, 5½d. Best beef from the butcher 8d per lb., coarse beef 6d. The cost of an inmate for the week was 4/8d. In 1918 the price of the 4 lb. loaf had risen to 9d. Eggs were 5/6d per dozen. Best beef from Mr Greenan, Ballinamore, 1-4d per lb., course, 1-2d. Cost of an inmate per week was 11-6d and of a fever patient £1-0-6d. There was no sugar available and the officers and nurses were given a small grant in lieu of the sugar to which they were entitled by the terms of their contract. For the first time in Years nurses and officers began looking for a salary increase. The Board at first refused to grant increases to the medical attendant Dr Rourke and dispensary doctors Dolan and Sheils. They withdrew their services and eventually Dr Rourke was granted £85 for the workhouse and £150 for Ballyconnell dispensary with £10 every 5 years until he reached £180. The other doctors were to begin at £130 per year with increases until they reached a maximum of £180. It was impossible to employ new nurses at less than £ per year and at this stage (1918) Nurse Byrne's salary was increased from £23 to £30 per year, Mr Bannon Clerk, increased from £50 to £70 per year, Peter McTeague, Master, £30 to £45. Patrick Heavy, Porter, from £20 to £26, Miss Keane, Matron, £26 to £35, all on request. Nurse Doddy, a new nurse was earning £40 per year. James Brannigan, the sweep gave his new tender: £5 per year for sweeping chimneys and 3/6d per day for whitewashing. He was granted £4 for the chimneys per year and 2-6d per day for whitewashing. The 'flu seems to have hit the workhouse in 1918 and nurses Byrnes and Doddy are reported on the sick list. Usually the Board was under pressure for Local Government for more expensive services and in turn blamed by the rate payers if the rates increased. In 1920 Local Government asked for economies, pointing out that the annual bill for medicines was excessively high at £22. This led to a discussion on the subject of amalgamation with other Unions. The Chairman for 1921 was Thos. O'Reilly, Derryginney, Ballyconnell, vice-chairman, Charles Lynch, Kilegar, Dept. vice-chairman, Patrick Keegan, Doogary. There was some excitement in February 1921 when the workhouse was surrounded by units of the British Army and searched, presumably for patients with gun shot wounds. The search proved abortive. There were then six patients in the fever wards suffering from diphtheria. In 1921 Francis Duffy, Port, submitted a tender for milk at 2-6d per gallon. This was reduced to 2/- . One member said he couldn't face his neighbours if he voted for even 2-2d per gallon. Letters were coming in from other Unions on the question of amalgamation. At a meeting in August Michael McBarron proposed they amalgamate but retain the infirmary as a local hospital. An amendment that they retain the board rooms and clerk's office was carried and Patrick Keegan and Francis McGovern were nominated to attend a meeting of other combined boards and vote for amalgamation with the limitations mentioned. At the meeting in Cavan it was agreed that the Boards of Guardians be abolished and a new committee of management be appointed for Co. Cavan. The old Cavan Union would nominate four members to the new committee, Bawnboy, Coothill and Baileiboro two each. At the next Bawnboy meeting Mr Bannon, Clerk, stated that the workhouse had been built to house 500 and the general average was now 40. Of these 23 would belong to the new Cavan amalgamation ten of these were prepared to live in the Cavan Home while the other 13 intended staying with relatives and friends. The remainder would go to Carrick-on-Shannon. At a meeting on 11th November motion of closure was passed. 10 inmates were to be sent to Cavan and all officials were to get two weeks notice and advised to apply for a pension under a superannuation scheme. Officials mentioned were Michael Bannon, Clerk, Andrew McPartlan, Master, Miss Keane, Matron, Pat Heavy, Porter, Nurses Doddy and Byrnes. In addition these go lump sums varying from £70 to £80. Mr Edward O'Reilly, clock repairer, Ballyconnell, looked for a grant but was refused. It was suggested that he be given any of the clocks that remained. Mr Edward O'Reilly auctioneer, Lisanover, was appointed to auction surplus stock on 19th December. Mr John Maguire was appointed temporary caretaker and later his son Hugh was given the permanent position. A committee was appointed to inspect the buildings from time to time. These were: Chairman and vice-chairman of the Board with Rev Terence and James Brady, Wm Teggart, P.F. Baxter. M. Doonan, P. Smith, Meenaghan, F. McGovern, Patrick Heavy, E.J. Brady, Tommy Baxter and Patrick Bannon. Although the Union Buildings were officially closed as a workhouse some of the staff continued to live there. Michael Bannon, the clerk took over a section adjacent to the Boardroom. Hugh Maguire, the caretaker set up house in the master's rooms. Miss Kane the matron, and Nurse Burns continued to live in the rooms originally assigned to them. Later the Gallagher family, Guard Doyle, the McGinn and Dolan families made comfortable homes there. One of the wings was converted to use as a Vocational School in the mid-thirties and was in use until the new Vocational School was opened in 1967. The Boys Schoolroom became a concert and dance hall. Practically all George Sheil's plays were staged there by the local dramatic society. Various travelling companies presented dramatic or variety shows. Others presented the silent and later films of Charlie Chaplin and of Laurel and Hardy. The converted school room once housed a successful boxing club and different generations learned Irish dancing there. With the purchase of the Wonderland Ballroom as a prochial hall the workhouse hall was closed . The chapel is the last link with the old workhouse. It was retained as a chapel of ease for the Bawnboy area. At first the Blessed Sacrament was not reserved. Older people middle aged parishioners will remember a unique part of the liturgy: Michael Bannon's meticulous head count at the Offertory of those who intended receiving Holy Communion. Fr Arthur McMahon, C.C., had the Blessed Sacrament reserved in 1942. To celebrate the event new seats were installed, made on the site by Guard Doyle and Mr O'Mahony, Vocational Teacher. The Chapel was extended in 1954 by Fr Edward Tully, C.C. 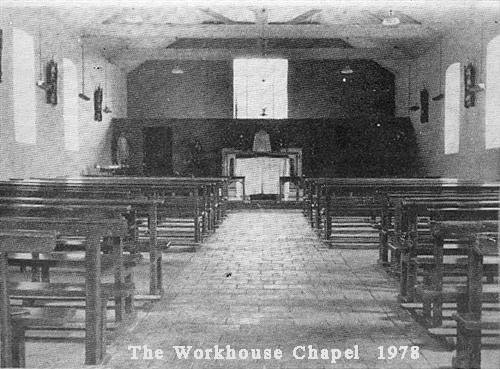 When the new St Mogue's church opens the workhouse chapel will be closed and this will mark the closing sentence of the final chapter of the story of the workhouse. B. Keane, V.C., Chairman, Peter McCartan, Patrick O'Kane, Thomas O'Reilly, Patrick McTaggart, Thomas McKiernan, Thomas Kellegher, Thomas Shannon, Anthony McGovern, R..H. Johnstone, Peter Fitzpatrick, Patrick Fay, Myles Prior, Philip Gaffney, James Kelly, James Pakenham, J.W. Elliott, Hugh Shannon, Michael Cahill, Bryan McEnroy, Michael Maguire, James McCartan, Patrick Keegan, Thomas Keegan, Francis Dwyer, Michael McGovern, Arthur McLoughlin, Charles Lynch, William Woods, Francis Reilly, Bernard McManus, John Mcguire, Peter Conafrey, Michael Cafferty, Francis MacBarron, Terrence MacAloon, Edward McGovern, Patrick McGovern, (Clarbally), Patrick McKiernan, Owen Maguire, Eugene MacBreen, Michael Martin, John Magee, James McGovern, Patrick Duffy. Patrick Reilly, William Johnston, James Carney, Peter Meehan, Philip McGovern, Patrick Fay, Laurence Dolan.